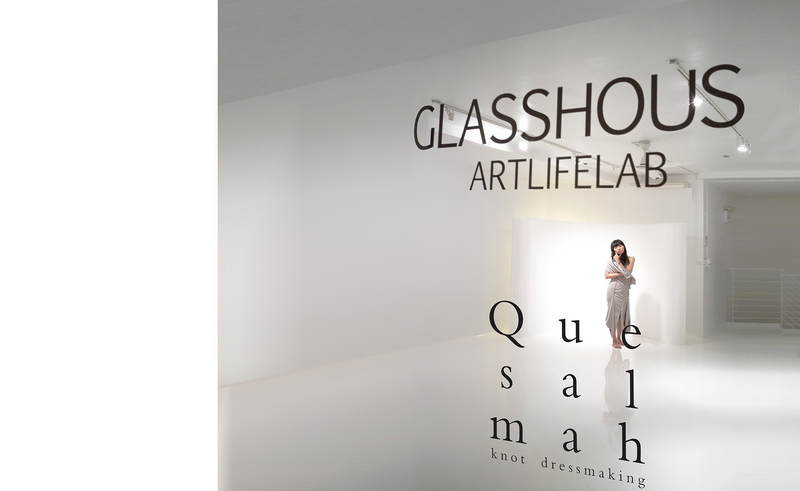 For the official launch of their couture fashion brand, Que Sal Mah—dresses inspired by the intersection of fashion and performance—the creators asked the studio to create their logo and redesign their Williamsburg storefront as a hybrid space: an atelier that expressed the elegant minimalism of their dresses where clients could have a one-on-one dressmaking experience, as well as a venue for performances. Informed by the aesthetic as well as flexibility of the “white box,” a pure palette of white, articulated by intersecting smooth and textures surfaces, creates an elegant visual expression of the brand, and is at the same time a refined canvas for performances. With white ceiling and walls, and a white resin, poured over the existing, uneven concrete floor the space becomes unified and infused with an ethereal aura. An expandable, freestanding paper wall that can be configured either as a linear or curving form provides a private dressing room for clients or a backdrop for performers. At the opening event of the boutique, dance and fashion came together with an amazing performance by Butoh dancers dressed in Que Sal Mah. The dancers slow hyper-controlled motions and the sensual silhouettes of the dresses were set in striking contrasts against the shimmering, smooth and textured white surfaces of the atelier.